No the new models seemed ok it was only the previously released models that seemed to do it from the last update you did which is not yet in the core game it seems all fine now I have added the files back again bit odd. No the models I listed were there just to help others and show what I used size wise. ah right yes that's handy to know I knew picnums changes worked but I was unclear as to actual textures! dd-963 Spruance seems abit small as well but I need to look at that because i think you did that model ages ago! I have no idea why the game would do that but as long as it works. Spruance should be somewhere around 0.35 in scale. It was released originally being too small but it was never updated in the core game. I am fairly certain I have poked BG about it once or twice. Going forward I will probably just push model and texture updates to github whenever I really have anything. For new models I might wait until I have a few as that is changes that require a recompile. I am also considering going back to monthly models. The exact number of models might vary though and I might make it bi-monthly or something. I still have not decided. It will in any cases be more along the lines of this github style than proper monthly packs like before. You are free to make any kind of mod using the content I have made. You are also free to bundle models should you want to. This is largely a modding resource. I see no reason to prevent it from going into mods. I have considered making a mod around this content. I do however not want to stick with stock files as I kinda also want to bring especially the modern east asian countries to a less wrong state and I do not think it will happen unless I do it myself. I think after the next update to the core files that's something I might do before i make the changes I normally do! The old F-4EJ Kai have gotten a slight overhaul and another 5 regional textures and a slightly adjusted model. The model change is just a minor UV map update. Some of them are not perfect as they where based on different F-4 versions with distinct visual differences. At this scale though they are probably still okay. The updated Phantom is on github. Also I have decided not to go back to monthly models. The current model of throw-stuff-up-on-github-when-ready does not really fit it. I am still considering what to do instead of it as it was an interesting idea. Maybe pick a theme to base models on instead? This might be a totally stupid idea and not possible but would you be able to have 2 sections if you like on GitHub? So say a beta not yet finished section then a released section? Not sure how GitHub works so might not be possible. Github has an option for making proper releases. Usually it is used for compiled versions of say a piece of software (github is generally intended for mostly open-source software) while the "clone or download" button just gives you a version you have to compile yourself. It is also possible to work with the folder structure and have folders named things like "beta" and "tested". My plan is to simply use the current folder structure as a beta and then when there is enough sufficiently tested content put it into a release version. These releases would be like the old ones only I put them on github instead of dropbox. Except for the aircrafts from December I do however plan to at least have proper default textures as well as UGBITS done for them before they are added to github. Not all regional textures might there initially though. Naturally there might be bugs like scale or possibly export issues. 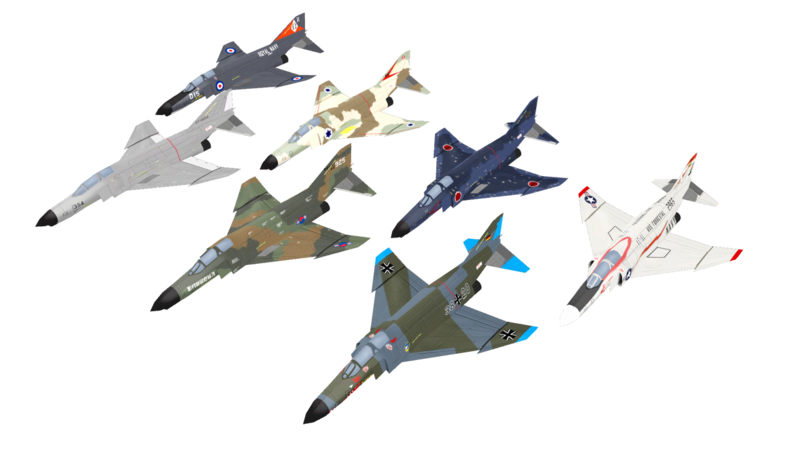 This update contains textures for the SEPECAT Jaguar (FMQZ), E2 Hawkeye (FIJUV) and F-CK-1 Ching-kuo (V). There is a minor UV map update for the Jaguar. 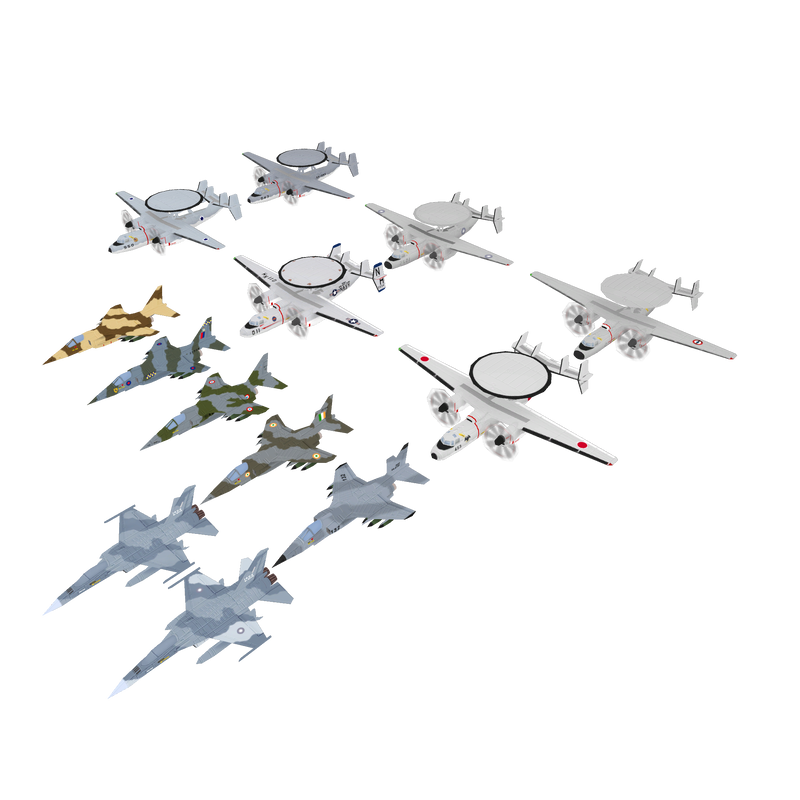 UGBITS8 has been updated with these models. the propeller blades on the E2 Hawkeye should be less visible in-game due to the darker backgrounds. Next update might have new models. Also I was thinking of going with a theme for 1-3 months instead of monthly models as this should fit better with this release style. For a start I was thinking of either going with late cold war or Israel and neighbours. Cold war would be warships and AFV's mainly and the mid east would just be AFV's as I want to do something other than aircraft. I am open to other ideas though just keep in mind that I would prefer not making too many aircraft. Textures look good especially the Jaguar can't wait for the Queen Elizabeth carrier if that helps you pick a theme? Trying to focus on a given area, time-period or theme does not mean I will not do any models not fitting it. E.g. I very much intend to still work on JS Asahi and JS Maya despite working on cold war units and those are post cold war. Also I want to maybe focus a bit more on ships than ground vehicles as I have been playing a bit of Cold Waters recently and it has made me want to make ships. For warships cold war basically means laid down before December 26th 1991. USS Seawolf qualifies in this definition. Naturally as I have already made a Seawolf I see no reason to make another. I am fairly certain it was a Type 42 SGTscuba was making but Royal Navy warships is not really my strong point. I do have a few other Royal Navy vessels planned but I would prefer to get a bit further with them before I go into detail. Also speaking of the Royal Navy if anyone got some decent top down pictures or illustrations of a British Churchill class SSN that would be nice. Front or back will not be dismissed either. Type 45 destroyer, HMS Albion, USS midway, INS Vikrant but then others from the same file, for example, the Nimitz works fine. It appears that the .dds plugin I am using does not read smart objects properly and all of those have been converted into smart objects. I have uploaded a new one that has them included.